BlogHome » News » News » How can you use Office 365 for collaboration? Occasionally, we talk to our colleagues. Quite old-fashioned, I admit, but it does work! I spent a day delivering an Office 365 workshop to a new client. Half of the people were in Southampton, half in Guernsey. The video-conferencing was superb, even when we both got kicked out of our meetings rooms and had to relocate during the day! Their pain-point was that they had several thousand documents that had to be organised and readily accessible to their team – manuals, training guides, design documents. They were stored in various systems, they were updated sporadically and there was little control over who could update what. Reviews happened by email, if at all. When the team ran large projects, there was no standard way of managing these. Some people used Project, some used Trello, some used Excel. Management didn’t have a way to get an overview of what was going on. People knew that these pain points existed, but didn’t have any way to discuss this within the business. Communication up through the levels was difficult because the operation is geographically diverse, and communication across the teams happened in an ad-hoc way, generally around the coffee machine. If Head Office wanted to communicate something to the staff, an email was sent out. There was no feedback on how many people read these, and no way for users to sort and filter relevant information. There was a better way! And this is what Microsoft is trying to enable with Office 365. Let’s take the challenges in order. SharePoint is getting comfortable in its own skin. No longer having to be all things to all people, it is being used to do what it does best – get documents organised! Day-to-day documents can be stored elsewhere. 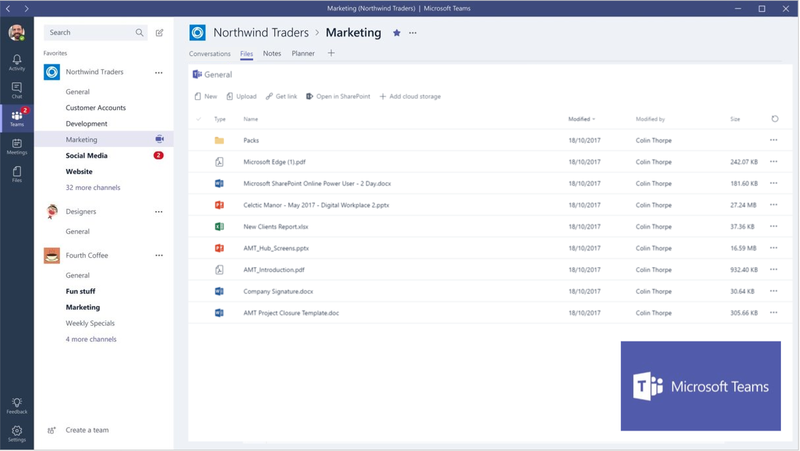 Microsoft Teams and OneDrive for Business provides masses of file storage for people to put project plans, design documents, spreadsheets, attachments from clients, drafts and so on. These can be for personal use (OneDrive) or for sharing with the team (Teams). SharePoint is then kept free to manage an organisation’s important documents. Policies, training material, reports, finished proposals, marketing material, HR files – all put where they should be and properly secured. Because SharePoint is just being used for the important stuff, people can now take the time to tag things properly. This means that each document is told what department, location, project, product it relates to. It is also told who is responsible for it and when it needs to be reviewed. When it is due for review, email reminders are sent out, and reports can be run to identify documents that are out of date. Rules are put in place to automatically archive out-of-date files. Email is a really clunky way to collaborate on documents. You do some work on a document, send it out to 3 people for their opinion. They edit it and send it back. Some people track changes, some add comments, some write a long email. You then have to trawl through all of this, create a new version and then email it out again for the next round. In SharePoint (or OneDrive or Teams) everybody can work on the same document at the same time. Paragraphs and cells are locked while somebody is working on them. You can see who is editing what, and look at their changes by clicking the ‘Save’ button. If you have Skype (or Teams) open, you can chat to them about what they are doing. All of the changes are stored in different versions of the document as you work, and so you can get back to any old work quickly and without have three hundred copies of the same file. If you’re going to go off-line and do a chunk of work on a file, you can “check it out” so that nobody else can work on it. It’s just a much more grown-up way to work. Wouldn’t it be great to quickly create an area where you can invite team members, allocate and organise tasks for everybody, have discussions, set up conference calls, store notes and see reports? Without having to go on a 2 day training course! Microsoft Teams has been created to do just this. It is fast becoming the main place for people to do their work. Skype for Business is being incorporated into it to make it an all-in-one communications tool. You can set up an area for your main team, with “channels” to divide different strands of work that you are involved with. Each project that you are involved with can have its own team, so you can hop in and out of different pieces of work. Wherever you go, all of the information is in one place, whether that’s project documents, chats, plans or reports. It is a fantastic hub for daily work, and new features are being added at a rate of knots. A close cousin of Teams is Office 365 Groups. These work in a very similar way – the major difference being that chat is done via emails. This is great if you are working on a client project and want to gather all of the emails together in your project. Sometimes, it would be great to be able to let the bosses know about your new idea. Or sound people out about a process improvement. Or get some feedback on what competitors are up to. Sometimes, the bosses might want to let people know what’s in the plans for the next year, or canvass opinion about a change. Yammer is perfect for this. When Microsoft bought Yammer in 2012 it was already an established tool for companies to use for internal communications, and Microsoft have pretty much left it intact. It is quick and easy to use. Think about having Facebook Groups just for your organisation -some groups are open to all, some by invite only, but all being used to discuss issues that are current within the business, and all being used by people across, up and down the organisation. 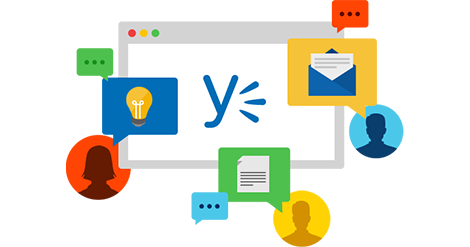 Organisations that use Yammer well get huge benefits – people feel that they belong and are being listened to, which is great for morale and retention. One of the nicest things about these tools is that they are just the starting point. They can all be built on and extended to do exactly what your business needs, and Microsoft has a comprehensive Roadmap of new tools and features that they are producing. Layered on top of this are Privacy and Security Tools (Azure Rights Management and Intune), Enterprise Search (Delve), Business Analytics (Power BI), Customer Management (Dynamics CRM), Enterprise Project Management (Project Online). Microsoft, although far from perfect, has always been the company to pin your colours to if you are wanting to build an effective business. The latest offerings are making the cloud services compelling. If you are trying to figure out how to make Office 365 work for your business, our consultants are here to help you. Either ping us a message in the chat screen (bottom right corner) give us a call, or send an enquiry via the contact us page.